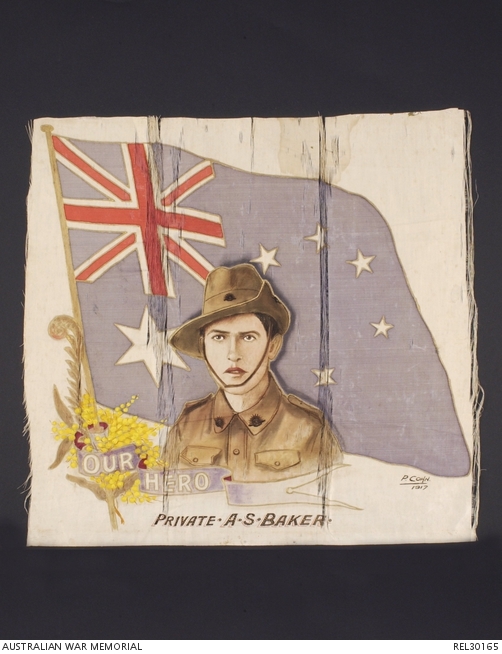 2860 Private Alfred Stanley Baker enlisted at Annandale, New South Wales, on 25 September 1916, and served with 60 Battalion, AIF. He died of wounds in France on 9 August 1918, at the age of 22. This portrait, painted in 1917, appears to have been copied from a photograph. Painted coloured portrait, on cream cotton sateen, of Private A S Baker. Baker’s head and shoulders are superimposed on a blue Australian ensign with a six pointed Federation star. Painted at the bottom of the flag staff is a bunch of wattle, eucalyptus leaves and a fern frond tied with a blue ribbon. The ribbon extends to form a base for Baker’s portrait and bears white, gold edged lettering, ‘OUR HERO’. Underneath the ribbon in black, gold and red lettering, is ‘PRIVATE. A.S. BAKER’. The artist’s signature ‘P. COHN 1917’ appears underneath the flag’s fly end.